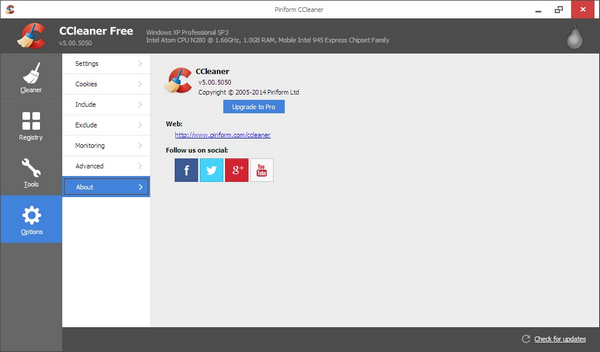 PureRa removes files from your computer that other mainstream cleaning programs tend to overlook. Some of the targets can simply be removed to create some valuable space while others are removed in an attempt to repair certain problems because they will simply recreate themselves. Targets that are currently removed by PureRa are: Config.msi, Thumbs.db, Iconcache.db, .sqm-files, Desktop.ini etc. Stealth: ? Yes. Writes a log file to the drive root by default. How to extract: Download the ZIP package and extract to a folder of your choice. Launch PureRa.exe. This is a great little tool, I do agree with Anonymous that some of the cleaning options are usually pointless as they will be recreated by the OS anyway, but it's always nice to have a tool that can do a deeper scrubbing than most other tools. I don't use PureRa often, but when I do, its because I want it done all the way. @Anon Yes it Cleans files that are not used but Also It Cleans ALL of them off of your system. Some of the files olny are created WHEN the particular folder gets opened. Over all this is a pretty good tool and very usefull. Best use for this. Do a good disc clean then Defrag your system. Who ever knew there was so much junk lying around! Xleaner is a comprehensive privacy tool and a clean-up utility that allows you to delete temp and junk files with ease. Xleaner can clear browser history, cookies, cache, search, auto-complete etc. It can also remove temp folders, recent documents, as well as run, search, open/save history and much more. Xleaner is extendible with Plug-ins, AddOns as well as Themes / Color schemes. NOTE: The development of program is discontinued. How to extract: Download the "Portable" ZIP package and extract to a folder of your choice. Launch Xleaner.exe. Ditto,I lost my regedit favorites and my address book,be careful with this app and make a restore point first! This utility really does a great job, and removes many useless files and registry entries in the process. It is missing one key element, however (in my opinion) and that is to allow the user to preview the scan results before committing and executing. Yes, you can set it to create a backup point, but that does not replace the ability for experienced users to see what is about to be cleaned prior to execution. One more small issue is there is no way to set 'Close' to mean exactly that. Close now pops the app to the taskbar, and that is not what I expect 'Close' to do. Give the user the option of having the app truly close. So far No Problems. But Nothing running installed other than OS, & Office.